The field of sports management is highly competitive. For most sports managers, the pinnacle of their career is to obtain a position with a professional team, but there are a variety of avenues you can choose to take with your career in sports management. As with most jobs, the foundation of any successful career is education. Most management positions in professional and collegiate sports are looking for candidates who have masters’ degrees in a related field; however, before you even graduate college, you can begin positioning yourself to find a job in sports management. Before you begin searching for a job in sports management, you’ll need to possess industry experience beyond the classroom. Volunteering is one effective method of creating relevant experience for your resume. Examples of volunteerism include helping out at a local sports tournament, assisting with game day operations at your university’s stadium, work at a summer sports camp, or by coaching a youth sports team. To get involved with volunteering, you can contact the athletics department of a local high school or your university. Alternately, a local sports organization may offer the opportunities you are looking for. There are also paid part-time positions, like working in a ticket sales booth, that can also be used to build your resume. When it comes to obtaining the sports management position you are looking for, networking is of the utmost importance. Most experts recommend that students begin networking during their undergraduate careers by asking their professors who they know of and could contact for interviews to learn more about working for particular organizations. A university’s alumni network also offers a valuable resource for networking. By reaching out to the right individuals, you can gain valuable insight and knowledge regarding the best methods of developing your career. Even if those with whom you network do not offer you a job, they can provide references and industry connections. In a similar fashion, joining professional bodies, societies, and organizations also provide a method of connecting with industry professionals. These organizations also enable you to remain abreast of the latest industry changes in standards, as well as provide publications that keep you informed of the most current work within the field. Sports management internships are highly competitive, but acquiring industry experience can be invaluable to getting your foot in the door. It is important to note that most internship programs have application deadlines, so you must exercise diligence in getting your applications in on time. You are encouraged to apply to as many programs as interest you. Online job boards can be used to find out what type of internships are available, and your university’s job placement department also offers a valuable resource for finding internships. Even if you have already graduated from college, there are many available paid internships that require a bachelor’s degree. Online job boards for sports businesses offer a diverse range of available positions to peruse. These job postings also list the specific requirements for the job and the application deadlines. For example, if you wish to obtain a position in collegiate sports, the NCAA Marketplace is the best website to search. Likewise, if you are looking for a position or internship within the arena of professional sports, TeamWorkOnline offers a valuable resource for job listings. Other websites that offer industry-specific jobs include WorkInSports.com and BlueFishJobs.com. However, it should be noted that the competition for these jobs is extremely fierce, so it may be more prudent to also look at sports management jobs that are available through sporting good associations, semi-pro sports teams, and national and local sports associations. Of course, it is always helpful to broaden your search as wide as possible, even across the country, rather than restricting it to one city. If you are having difficulty breaking into the sports management industry, then it may be time to investigate alternative measures. To address this need, the Manhattan Sports Business Academy was born in 2012. This revolutionary breakthrough program was designed with the sole goal of identifying, preparing, and connecting the next generation of sports management professionals. The summer leadership program calls New York City home, and the program is designed for young industry professionals and college students. The core of this program is to offer unprecedented experience and access to its participants, and the program accomplishes via weekly speaker series, internship placement, mentorship, office field trips, career workshops, and much more. By participating in the program, students are equipped with the resources, knowledge, and network to take their careers to the next level. If you want to obtain your dream job of working in sports management, it is exceptionally important to have a plan of attack. Getting your education is the first step. Specializing in a particular sports management field, like business or finance will further elevate your marketability to employers. Obtaining industry experience through internships and marketing are equally important. 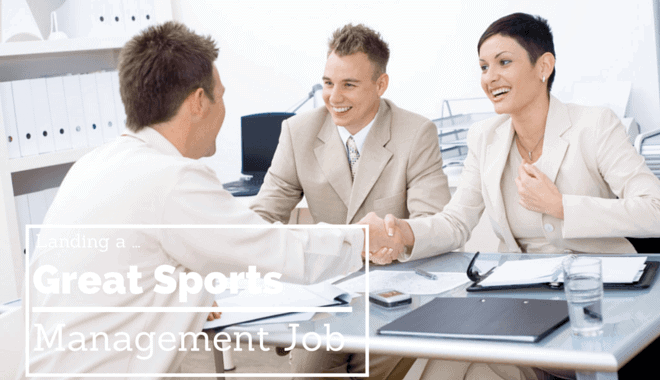 Sports management jobs are among the most sought after in the United States. How are you going to differentiate yourself from your competition?